Innovative solutions out of one hand. HAIMER offers the right clamping technology for every industry, application and typical machining operation. Take advantage of the innovative solutions from the technology leader for tool holders. With the brand-new Power Mill endmills and the pioneering Duo-Lock™ system, the modular interface for carbide tool heads, HAIMER offers a comprehensive range of universal solid carbide endmills for machining steel, stainless steel and cast iron materials. For years, HAIMER has been the leading developer of inductive shrink fit technology for tool holders. Rely on our broad experience and use the world’s largest range of shrink fit equipment and coils. With the Tool Dynamic series HAIMER offers a universal machine concept for balancing tool holders, grinding wheels and other rotors. Increase your productivity with less unbalance in your production. With the HAIMER Sensors you have a versatile range of measuring instruments for measuring and aligning work pieces and vices. A sophisticated tool storage, setup and management are the requirements for an efficient production process. With the Tool Management HAIMER offers a complete solution for tool presetting and management, which provides maximum efficiency and ergonomics. In addition to precision, speed and reliability, the UNO series also includes numerous features in terms of its equipment. The new design and improved ergonomics set new standards. 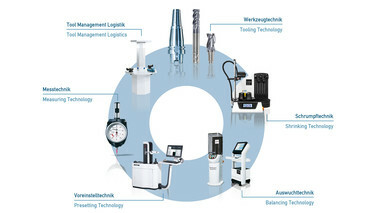 We at HAIMER see ourselves as a system provider along the complete value chain of tool holding. With our extensive tool holder program, a associated balancing and shrinking technology, our tool management logistic systems, as well as the 3D measuring instruments and our new power mill tools, we are offering you a perfectly coordinated product portfolio. Take advantage of our full technical know-how and many years of experience in tool holding technology. With our products we support you reducing your manufacturing costs sustainably and achieving a long term competitive advantage for your company.